My name is Clément, I'm from France but relocated for a few years in Brussels. I have a high frequency parasite, kinda like this more or less 15kHz old TVs were producing. It's not that loud, be enough to drive me crazy and not to use it on stage. I tried all kinds of plugging, with & without USB, power adapter, and even a 9V battery, so I'm 99% sure it comes from the PreenFM. It's here always at the same volume wether I turn the Vol knob up or down, so I would guess it's not exactly on the signal path, but more in the Ground? Has anyone experienced this? Any idea what could be the source of this parasite? Re: Hello, new to the board :) / High frequency parasite? The 'parasite' is more than likely from the OLED. They are noisy little b*ggers. On my synth, the noise is bad at the top 5% of the volume pot but much lower below. It is low enough that it does not bother me at all. They do like to infect the ground with digital noise. Maybe, a bad solder joint? Thanks Martin, I think the OLED seems to be exactly the problem. I just checked on google and the first answer is from… the Shruthi community! I have never noticed this on mine because I don't have an OLED screen it seems (I have to say the screen of the PreenFM looks so nice!). Anyways, some people have been struggling with the same issue, there's even someone who measured it around 15kHz so I guess I'm getting close. I can confirm that in the last 5% of the Volume course it gets worse, but still, to me it's not usable like this on a long term. OLED removed => no more noise! I just checked as a matter of interest. With a simple monophonic sine wave at -6 dB. The regular noise is at -67 dB. Which seems very reasonable for a synth. The noise at the 5% end is about -54 dB. I think that might be to do with the limits on the pot. I'm glad you like your new FM synth. I can hear a high pitch noise parasite if my headset volume amplifer is set the the MAX.... which kill my hears if i play sound with pfm2 volume more the 50%. For the story, the first idea was to put a blue OLED screen, but the noise it added made it unusable. The yellow one is hardly hearable on reasonable volume on the preenfm i have. You can try to manually add (make pins touch the PCB no need to solder) some electrolyte capacitor in parallel to the existing 220uF ones. Hmm. I have an ugly blue Newhaven one. My 2 newhaven blue OLEDs add a huge background noise and not only in the high frequencies. I can lower it a little (-3db) by adding a big electrolyte capacitor between GND and 5V at the bottom left of the PCB. First of all thanks a lot for taking the time to reply! Unfortunately so far my research wasn't very successful… I tried to put a big electrolytic cap across the spot you talked about Xavier but the reduction is not enough for me I'm afraid. Didn't get great success around the 220uF neither. Mmarsh: indeed I found a topic in the Mutable community, the idea was to put a cap at the spot Xavier was referring to, but straight on the OLED pins, which I tried also. Martin: I suppose I'm a bit over-sensitive in this frequency range, but I'm sure my synth is somehow faulty, I'm going to double check again the soldering because I'm usually not really difficult with background noise. 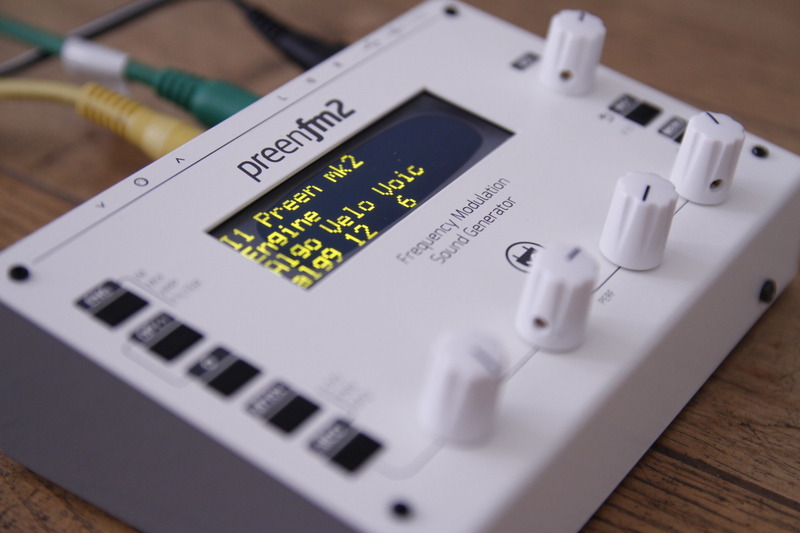 I did find one solution that works 100%: plug the PreenFM through a passive D.I. with GND Lift. Like this I have a regular background noise, there might be this frequency a bit stronger (when you know it), but it's more than reasonably quiet! EDIT: I forgot, does anyone know of a compatible non-OLED screen? There's no LCD screen compatible with this OLED one. I wonder if individual OLEDs have different noise levels? If you actually can use your BLUE oled display, i would answer yes. But from my experience, my 2 blue displays are unusable. The 5 or 6 yellow ones i tried were all silent. My analyser tells me the offending frequencies on the blue OLED are 2-3kHz! Wav file below... regular noise, sine waves, full volume noise.